The American Pit Bull Terrier ( APBT ) is generally considered a medium sized breed of dog. Examples throughout history however range from low 30lb range to just over 100lbs. The earliest standards did not consider this a factor but merely express that weight should be proportional to height. Pit Bulls have short hair, which is relatively smooth to the touch. Pit Bulls come in all colors and patterns. The first ever written standard on the breed in 1936 expressly states "Any color, solid, parti or patched is permissible". The next oldest written standard explicitly states "Any color or marking permissible." 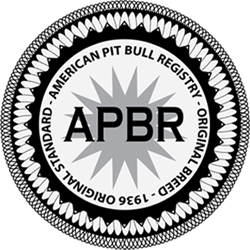 At the American Pit Bull Registry ( APBR ) we take this seriously and feel there is no reason to believe that the term "any" should be confused to mean anything other than what it is. Since this color determination was made by two separate registries at two separate times there is no reason to believe there was any confusion or misunderstanding as to exactly what their intentions or understanding of color or patterns were when defining this for the APBT. Recent discrimination against purebred Merle Pit Bulls within some registries has only been an issue since 2005 when a small minority of power players in the registration industry based on personal bias and internal politics chose to single out the Merle Pit Bull for exclusion. After 100 years of an accepted standard and nearly seven decades of written standards to think that this was suddenly up for discussion or debate is simply unreasonable. 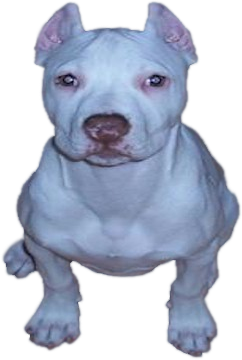 Some of the most well known Pit dog men in history have been known to own and breed Merles and historical evidence supports the case of Merle Pit Bulls to before the first written standard was ever put to paper. The Pit Bull breed has evolved over hundreds of years to be a worker and is well suited to most any task requiring strength, agility, and intelligence. A well-developed American Pit Bull Terrier ( APBT ) should be muscular in build with well-pronounced chest and legs. A Pit Bull's head is often described as brick-like but is actually more in the shape of a wedge. 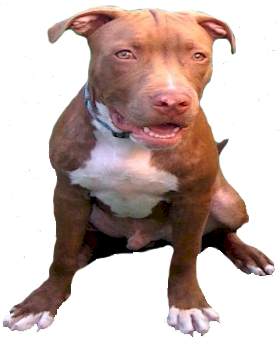 The muzzle of the Pit may vary in length but a Pit with a well- developed head will have a wide muzzle at maturity ending at a muscular jaw. The tail is often described to resemble a lever and ends in a tip. Although some Pits may have their tail cropped this is not recommended as it affects their balance. A Pit Bulls tail is never in the shape of a corkscrew. The ears of Pit Bulls are set rather high on the head and may be cropped or un-cropped based on preference. When a Pit shows interest or expresses joy in something its ears will often move toward each other revealing wrinkles on the forehead. Pit Bull's eyes are round or oval in shape and come in all colors including blue, which are often related to the Merle gene. Merle genetics may also reveal itself in blotches on the coat and is typically manifested this way in reds and blues but may affect any other color or pattern. The nose of a Pit Bull can be any natural color but in most cases are black, red, blue, or speckled. A well-mannered and properly socialized Pit Bull will exhibit confidence in most every situation. When a task brings itself to light the Pit Bull is typically inquisitive and exhibits a can do and don't give up attitude. This attitude is what makes up the foundation trait known as "game". The Pit Bulls intelligence is unsurpassed and can get it into trouble sometimes once it figures out it is a natural escape artist and can climb trees and other obstacles almost as good as a cat. Because of this ability it is of the utmost importance to keep objects and trees away from any fences that are intended to confine them. Pit Bulls have a natural tendency to want to please their owners and strive for human attention. Pit Bulls make excellent family pets but should be watched around children as their exuberance, size, strength, and weight may be overpowering. Human aggression is not natural to the breed and when exhibited is typically based on its instinct of protection. When a Pit Bull exhibits regular aggression this is often the product of heavy inbreeding and subsequent mental instability. 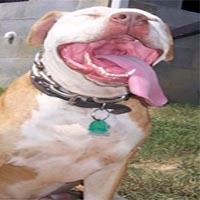 Pit Bulls can be trained for most any occasion ranging from service and therapy work, guarding, hunting, rescue, and the activity it loves best; couch or bed warming. Although all Pit Bulls need physical activity to help release their large stores of youthful energy, head pats and belly rubs are always a welcomed second.